Our experience is absolutely consistent with that claim. We selected dark blue for the topsides and, as is correct for the Commander Aristocrat model, she will be light oyster below her spray rails. We have continued our practice, one that is urged by Don Danenberg, of applying five coats of Interlux Interprotect 2000E barrier coat below the waterline, but have also applied three coats to the topsides to absolutely inhibit any water infiltration. 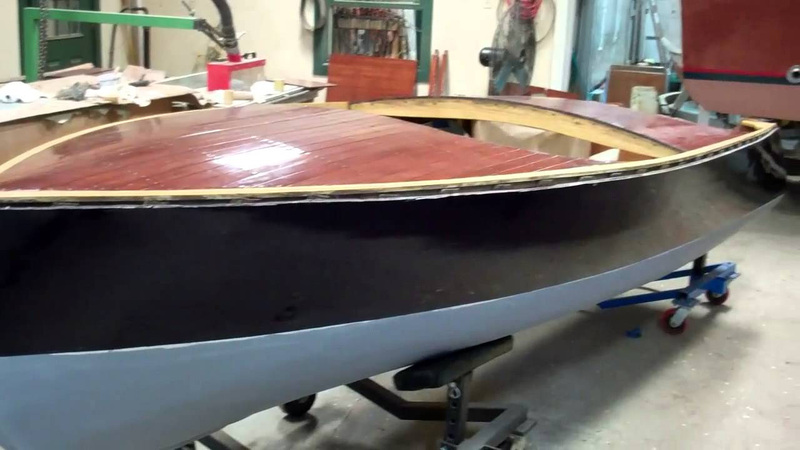 As Epifanes Monourethane explicitly forbids direct application over an epoxy primer, which 200E is, we followed the barrier coat application with two coats of Jamestown Distributors’ TotalBoat Topside Primer. The existing finish on the splash, rub rails and coaming proved to be beyond saving, so we have stripped and bleached, stained and have begun varnishing them. Happily we will be able to save the original finish on the fore and aft decks. A light sanding with 320 grit will be followed by 6 – 8 coats of Pettit Easy Poxy Hi-Build varnish. The existing finish on the hull’s interior and bilge will be saved as well. We will clean vigorously with a brass brush, sand all surfaces lightly and then apply several coats of Sikkens Cetol Marine varnish. Next PostNext Flipping Our 1953 22′ Shepherd Sportsman! OMG!